What better way to cap off the year than by making a glittering entrance into 2018 with sparkling shoes? 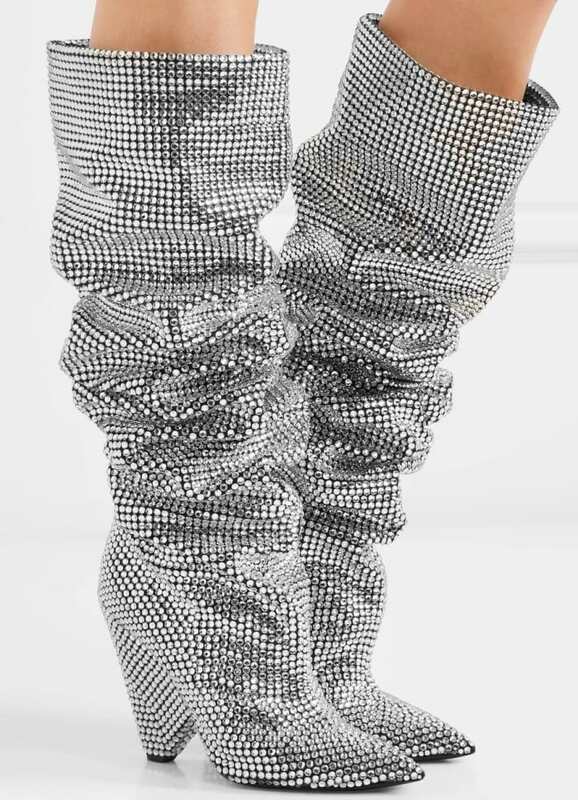 Saint Laurent recently gave its “Niki” boots a major boost with thousands of Swarovski crystals for an opulent finish. 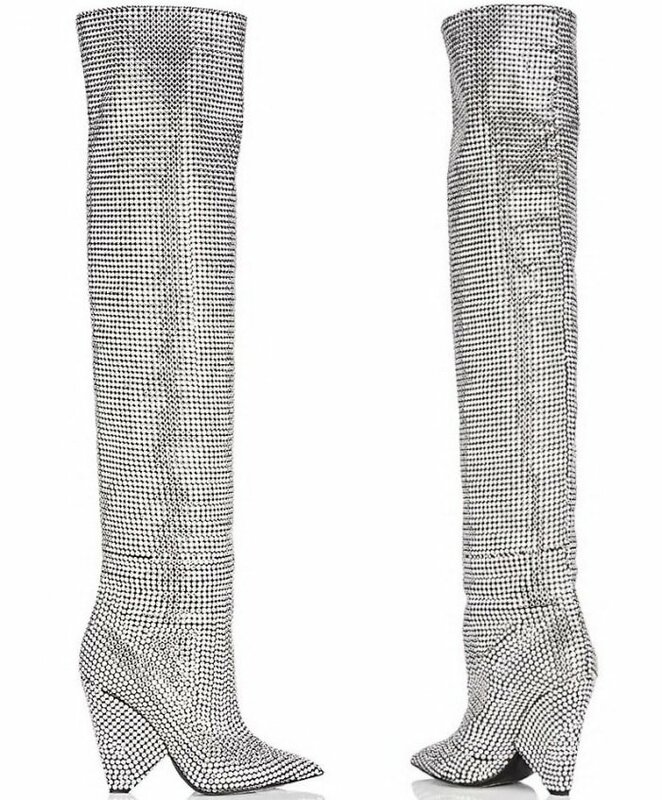 This over-the-knee design definitely set the standard for embellished boots this season. Masterfully handcrafted in Italy, these shoes feature a pointed-toe silhouette, a pull-on style, Swarovski crystal embroidery and self-covered cone heels. 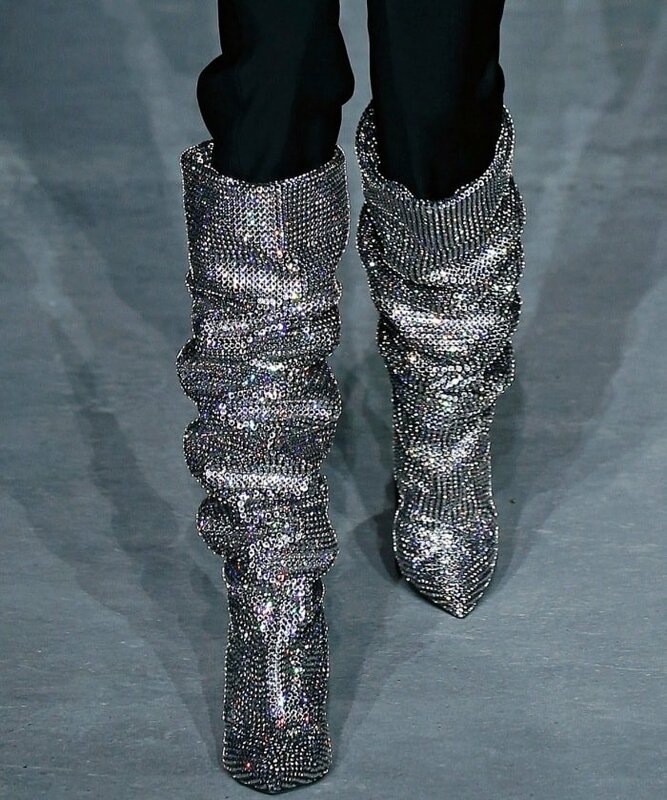 They can be worn over the knee or scrunched down, as seen during Saint Laurent’s Fall 2017 runway presentation. Model wearing Saint Laurent’s “Niki” crystal-embellished over-the-knee boots. These sought-after boots dominated fashion spreads and Instagram feeds this year. A-list stars and shoe aficionados clamored for their own pair despite the hefty price tag. Coming in at a jaw-dropping $10,000, these embellished designs are the year’s priciest boots. They’re also the second most expensive shoes of 2017, behind Pharrell Williams and his Human Race NMD x Chanel collaboration (up to $26,731.99 on eBay). Fans of these shoes include Beyonce Knowles, Nicki Minaj, Rita Ora, Celine Dion and Kendall Jenner. 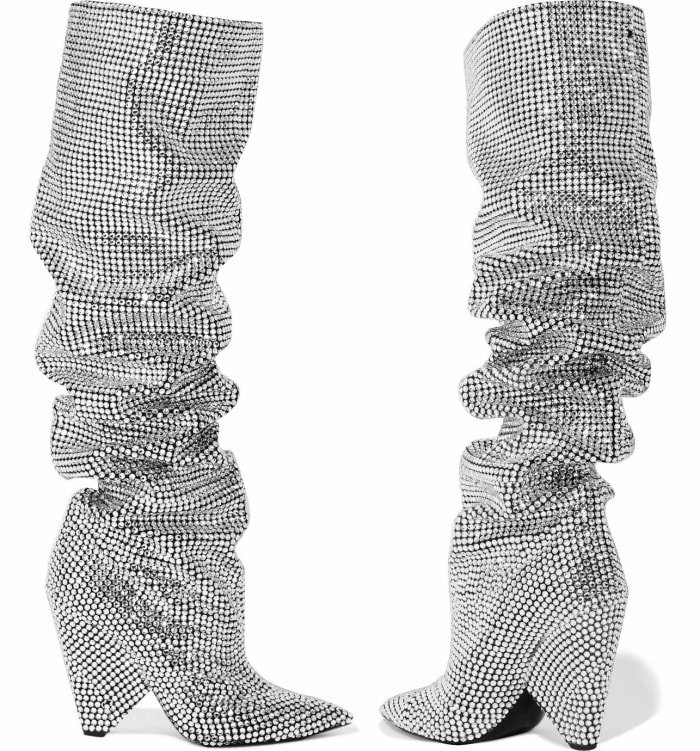 Rihanna wore these Saint Laurent boots fresh out of the runway back in March and shared the photos on her Instagram. Rapper Cardi B also flaunted her own pair during her performance at this year’s MTV Video Music Awards pre-show. Cardi was styled by Kollin Carter, and wore a custom sparkling outfit designed by Angel Brinks that featured delicately placed stones that matched the ones on her embellished boots. This was Cardi B’s first appearance at the awards show, and it was the perfect way to make a lasting impression on stage. Other iterations of these boots include the leather and suede mid-calf ones that Chrissy Teigen wore while strolling through LAX. Last month, Olivia Culpo also wore the “Niki” over-the-knee boots in black glossed leather (available at Net-A-Porter) while out and about in Los Angeles. She styled them with the Gucci “Coco Capitan” logo shirt tucked into black GRLFRND skinny jeans (available at Net-A-Porter). A black Ruslan Baginskiy baker boy hat and a red croc-embossed shoulder bag from Saint Laurent finished off her look.